Your getting closer and so is Talladega 2019! talladega is coming too fast for my wallet, lol. no way the car will be done, but i do hope to have the cone on it and the engine back together for the trip. i just could not bring myself to put a glass nose on the car. luckily, an old friend pointed me toward a new friend, who he made me a great deal. i have the cone, z brackets, grille frame and screen, side markers, and turn signals. now to gather the rest. then it's on to the latch tray. then the lower valance. then the one hundred other things. a big thank you to the forum members here that have helped me get to this point. I have a Daytona lower spoiler for the nose its oe if you are lookin for one maybe you mite have something to trade me for it. 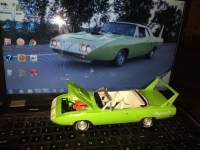 I am looking for parts for my Daytona clone. the only extra stuff i have are one set each of reproduction trunk hinges and wing supports, along with two used driver side turn signals. these items came as part of a package deal with the brackets above, that i needed. retired it from lumber rack duty earlier this week, and started removing the 70 front end. The Daytona looks better already! Is that a van nose motorhome to car hauler conversion ,just out side shop doors ? 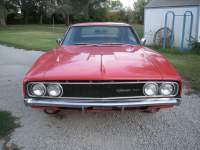 Con grads that's a good looking nose an parts..
are your tires age cracked, if not i"ve had good luck blowing all the dirt out of bead then cover bead an rim with grease or 90 wght oil an air up. it's a dodge motorhome chassis that was dragged outside to make room, no hauler conversion work done to it. the tires are about 35 years old. i wouldn't trust them down the driveway. expensive week, but some nice looking pieces are now in hand. also bought a set of pivots from mike. great looking parts, incredible packaging, and awesome to deal with. now off to procure headlight doors, fender scoops, and the lower valance. i'm trying to guilt mike into making me a set, but he's booked up for the time being. likely summer before he can get to them, he said. i'm also playing phone tag with ted janek, who left me a voice mail about his offerings. he now offers three different quality/price levels. i can let you know the details after i talk to him, hopefully tomorrow. Looks like things are moving forward, good for you . Just think another Daytona will be back on the road soon. even if it's not running, it will be nice to see it taking up more room in the barn. finally dragged the nose cone home from my buddy's shop today, nearly a year after buying it. thought i'd take advantage of the photo op before sitting it safely on the floor. Here is a 26 inch core support cut from a 1969 B5 blue Mopar B Body. Close by here in Indiana! shoot me a price, john. you have my email and phone number. if you're available one afternoon this week, i can head up and get it, along with the other stuff you've held on to for me. not to mention drool over what this car could look like someday. that would also give me a chance to see if i want to bite the bullet for the other sheet metal. E-mail with price for the 26 inch core support sent. 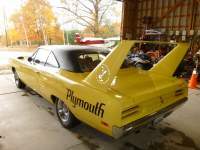 Is there a published parts list that details all the required parts and modifications to turn a 69 Charger into a Daytona?